SFW205UPC Alarm Fire/Water Safe is rated 4.5 out of 5 by 6. 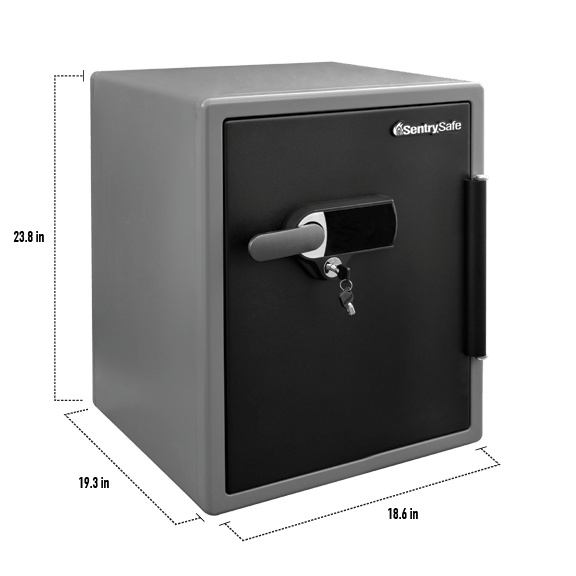 The Digital Alarm Safe SFW205UPC is built to protect your valuables from fires, floods, and theft. An audible alarm provides added security for unwanted entry, while a digital touchscreen keypad allows for you to easily access your items when you need. Fire and water protection make this safe ideal for the storage of important documents, digital media and other irreplaceable items. Rated 5 out of 5 by BS 1 from Based on 2 days Use So far excellent, size seems just right for home use. Water, Fire Proof and 6 bolt door lock were big selling points for us. Even Bank Safety Deposit Boxes don’t offer this. Digital Keypad, plus Key and security alarm also big pluses. We are about to give up Bank Safety Deposit Box and eleminate those trips to Bank and hassle of signing in to gain acess. 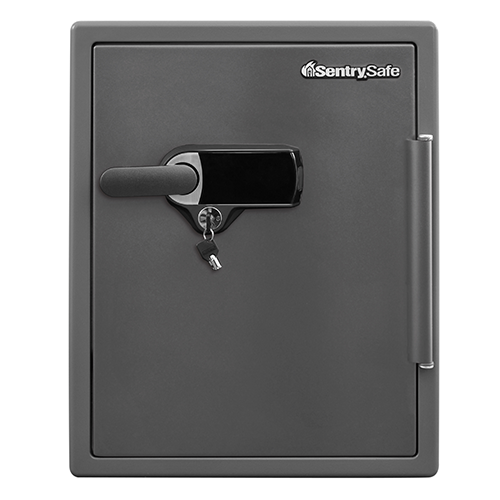 A Sentry Safe Seems Solution of Future. 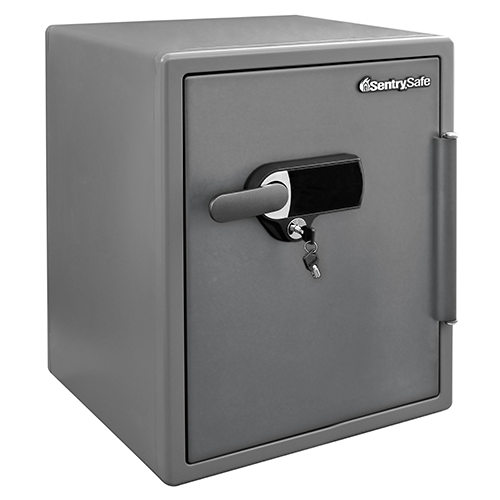 Rated 5 out of 5 by Calabash Man from Sentry Safe model SWF205UPC is perfect for my need This model has plenty of room with a hanging file folder and a tray included. Safe weighs 140 lbs so someone cannot pick it up and walk away with it. 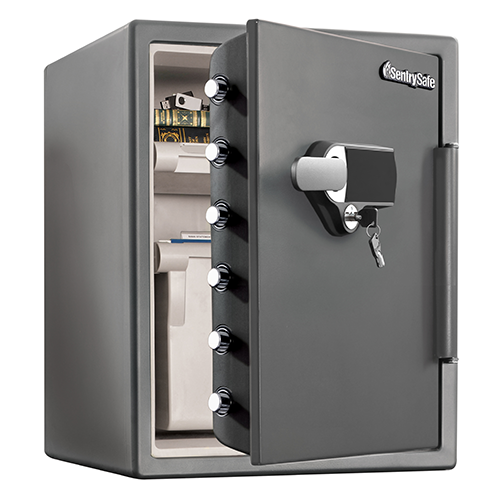 Security with your own 5 digit code, plus an added key lock that locks the handle if someone gets your code. Hey, that is all I needed! Rated 4 out of 5 by Oswego Time from Plenty of space. Nice lock bars. Concerning arm. This is easy to use for the combination. Has a lot of nice space inside. Our valuables are safe! I do have worry about the longevity of the arm. It appears flimsy. Time will tell.... Using the key is not the easiest but it is comforting having the back up of the keys. Rated 4 out of 5 by RogerW from Good features Roomy enough for all my "stuff" that needs to be kept safe and secure. Like the pull out hanging file and adjustable top drawer. The handle is really stiff to operate but I think it may loosen up a little with use. Rated 4 out of 5 by PhilM from Adequate safe for the money This sturdy and solid. It has a nice appearance and finish. The handle binds a little and the digital screen requires a solid push to illuminate - not a “tap”as suggested in the manual. Rated 5 out of 5 by jnibarg1 from directions good to help set up for the first time just the right size for my needs and is fire resistant and water resistant.